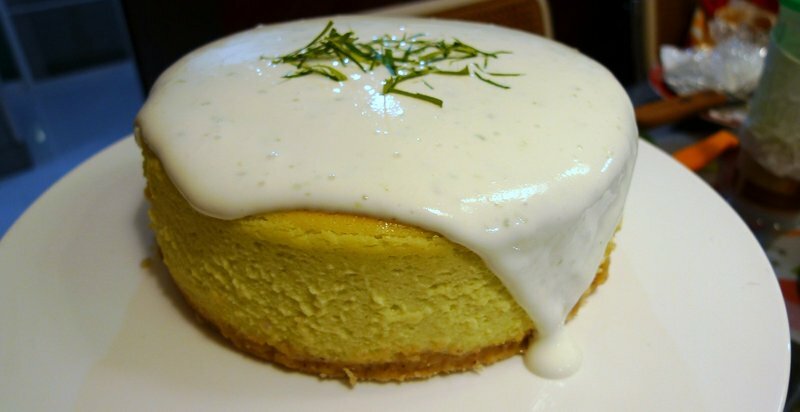 As dessert for a barbecue with friends last weekend, I baked a kaffir lime cheesecake. Kaffir lime, a member of the citrus family whose fruit and leaves are an essential part of Thai, Indonesian, Laotian, and Malaysian cuisines, is an unusual flavoring for cheesecake. It is very aromatic but also astringent, a quality that I thought would go well with the richness of cheesecake. To impart the flavor, you boil cream with whole kaffir lime leaves and then let it simmer for about twenty minutes as the cream reduces. The sweet, almost lemony scent is distinctive and you cannot successfully substitute regular limes for kaffir limes. Most Asian markets sell kaffir lime leaves, which freeze well. The end result was fantastic. The recipe, which I based on this one (but used two eggs instead of one as I think the author wrote the incorrect number), produced a substantial but not overly-heavy cake, rich enough to be a dessert while not leaving you feeling like you ate a brick. Deviating from the recipe, I made a sour cream glaze with kaffir lime zest and sugar. I will definitely make this one again. This entry was posted in Uncategorized and tagged baking, cake, cheesecake, cooking, dessert, food, kaffir, lime by christao408. Bookmark the permalink. Oh yeah – I would love to try this. I’m eager to make this! The cake looks so beautiful too. yummmmm. thanks for the recipe! I draw the line at cream. I use kaffir lime leaves in many dishes I cook. The cake looks really good. Would love to try it. That not only looks yummy but it looks very decorative also. TY for sharing the recipe. @Grannys_Place – Thanks for the recommendation. @ZSA_MD – Yes, it is also quite common in Indian cooking, isn’t it? @Inciteful – In terms of health? @l0311879l – @Ikwa – Glad you enjoyed it. @mlbncsga – If you make it, be sure to share the results please! @NVPhotography – Time to try making the cheesecake, then, right? @nov_way – Glad my literary license made you smile. @awoolham – A little secret – I added about three drops of green food coloring to boost it a little. The green from the kaffir lime leaves was so faint as to be almost unnoticeable. @SherryAngeLMysteriez – A high compliment, indeed! @ElusiveWords – @Fatcat723 – Would be honored to serve it to you. sounds intriguing! i like cheesecakes that don’t taste like you’re eating a hunk of cream cheese (you know what i mean), so i’m always curious to see what interesting flavors other people add in. yours looks like it came out quite nicely (and didn’t crack!). @christao408 – Haven’t cared for dairy ever since I lived on a dairy farm as a boy. Ooooh, I would love to try this cake. I love the scent of kaffir leaves.